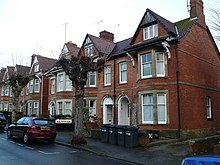 Houses in Yeovil, some of which have become HMOs. A house in multiple occupation (HMO), or a house of multiple occupancy, is a British English term which refers to residential properties where ‘common areas’ exist and are shared by more than one household. Common areas may be as significant as bathrooms and kitchens / kitchenettes, but may also be just stairwells or landings. HMOs may be divided up into self-contained flats, bed-sitting rooms or simple lodgings. Strictly speaking, HMOs are not the same as purpose-built blocks of flats, since most result from the subdivision of houses (often but not always large houses) designed for and occupied by one family. Some legislation makes a distinction between those buildings occupied mainly on long leases and those where the majority of the occupants are short-term tenants. "was originally constructed or subsequently adapted for occupation by a single household"
Both the 1985 and the 1989 Acts have since been superseded by the Housing Act 2004, which established a more complete and complex definition and also introduced the requirement for some HMOs to be subject to mandatory licensing (see below). The Housing Act 1985 was a consolidating act. The definition of HMO in section 345 HA85 was from section 129(1) of the Housing Act 1974. The Housing Act 2004 introduced mandatory licensing for large HMOs which were defined in the Act as properties with 5 or more tenants forming more than 1 household sharing facilities such as kitchen bathroom and/or toilets over 3 or more floors. On 1st October 2018 "The Licensing of Houses in Multiple Occupation (Prescribed Description) (England) Order 2018" amended the large HMO definition in the 2004 Act by abolishing the "3 or more floors" requirement. Nevertheless, purpose-built flats in a block of 3 or more such flats, were excluded from the amended classification. Apart from the statutory definition of HMOs requiring a mandatory licence, Local Authorities have the power to introduce approved licensing schemes which include smaller HMOs as licensable. Typically these are for 3 or more tenants forming more than 1 household. The Council Tax (Liability for Owners) Regulations 1992 provide a different definition of HMO that is used solely for determining Council Tax liability. HMOs are somewhat cheaper than a one bedroom flat with a room for tenants. When comparing the average tenant from an HMO and the average tenant from a one bed flat, the HMO tenant could save £1608 more over the year. HMO agreements often include most utility bills with the rent. This is because it is difficult for landlords to apportion the cost of bills to each tenant fairly and it is also more appealing to potential tenants. HMO licensing was first introduced in Scotland in 2000. To be granted a licence under the scheme, properties must meet certain standards, such as presence of smoke detectors and fire doors. These provisions were included in response to a fatal fire at a student flat in Glasgow, which had no working smoke detectors, and metal bars preventing escape through a window. HMO schemes have been subsequently introduced to other parts of the UK, though the definition of what constitutes an HMO varies between Scotland, Northern Ireland, and England & Wales. Definitions of what constitutes a household are set out in the law. After 1/10/2018, the three storeys requirement was dropped. Landlords of large HMOs must apply for a licence and must comply with certain standards and obligations. HMOs do not need to be licensed if they are managed or owned by a housing association or co-operative, a council, a further education institute or student housing provider, a health service or a police or fire authority. All HMOs must be registered and must comply with certain standards and obligations. Local authorities, manage and enforce the licensing of HMOs. the conditions of the licence. Failure to apply for or comply with the terms of a licence for an HMO constitutes a criminal offence. Tenants may be able to recover some rent from an unlicensed HMO landlord. HMOs are popular with buy-to-let investors because, it is believed, they have higher income-generating potential than ordinary or ‘vanilla’ buy-to-let properties (though, according to one 2014 report, the earning potential of HMOs was surpassed that year by multi-unit freehold blocks). By splitting single properties into multiple bedsits that are each let out on separate tenancy agreements, landlords can also reduce their exposure to loss of earnings through rental arrears or voids. Some argue that HMO investment is necessitated by insufficient housing supply in the UK, whilst others argue that it is exploiting it. Due to the additional legal requirements placed upon HMO landlords, not every buy-to-let mortgage lender will agree to finance HMO properties. This has led to the emergence of a specialised HMO mortgage market, catered for by a smaller subset of lenders. Because the choice of products is narrower, HMO mortgage borrowers are often subject to stricter criteria. Often they need larger cash deposits, as the average loan-to-value ratio is slightly lower than for an ordinary buy-to-let mortgage, while the minimum property value tends to be higher. Borrowers who are financing unlicensed HMOs may also be required to prove that their local authority has no intention to license the property in the future. It is also common for HMO mortgage lenders to stipulate the number of rooms permitted, the type of tenancy agreement and tenant demographic permitted and even the type of lock installed on internal and external doors. ^ "HMO Guide from GetRentBack.org". Helping tenants Get Rent Back. ^ "The lowest rung of the housing ladder?". BBC News. BBC News. 20 October 2015. Retrieved 20 October 2015. ^ Housing Act 1985, s. 345. Legislation.gov. Retrieved March 30, 2015. ^ Local Government and Housing Act 1989, s. 165(1)(c), Sch. 9 para. 44. Legislation.gov. Retrieved March 30, 2015. ^ Housing Act 2004, s. 266, Sch. 16. Legislation.gov. Retrieved March 30, 2015. ^ Housing Act 2004, ss. 254–260. Legislation.gov. Retrieved on March 30, 2015. ^ "Professional tenants save more in HMOs | Platinum Property Partners". www.platinumpropertypartners.co.uk. Retrieved 2015-10-22. ^ Shepperson, Tessa. "Tessa's Tenancy Agreements – where the landlord pays the bills". The Landlord Law Blog. Retrieved 2015-10-22. ^ "The Civic Government (Scotland) Act 1982 (Licensing of Houses in Multiple Occupation) Order 2000". Office of Public Sector Information. Retrieved January 10, 2010. ^ "Houses in Multiple Occupation: A Guide for Tenants". The Scottish Government. Retrieved January 10, 2010. ^ "Students welcome tighter controls on landlords". BBC News. September 30, 1999. ^ a b c "Houses in Multiple Occupation". ^ "Prescribed Description Order 2018". ^ a b c d "Rights and responsibilities in a shared home". ^ "Houses in multiple occupation | Newcastle City Council". www.newcastle.gov.uk. Retrieved 2018-02-09. ^ "Register a house in multiple occupation (Northern Ireland)". ^ "House in multiple occupation licence (Scotland)". ^ "Multi freehold blocks provide highest gross yields in UK for landlords - PropertyWire". PropertyWire. 2015-01-20. Retrieved 2017-11-21. ^ "New rules protect HMO tenants in Southampton multiple occupants". ^ Dyson, R. Buy-to-let: creating bedsits for 20pc returns is just a response to the market. The Telegraph. July 25, 2014. ^ [http://www.commercialtrust.co.uk/buy-to-let-mortgage/product-types/hmo-mortgages/ . Commercial Trust. March 18, 2015. Houses in Multiple Occupation at The Scottish Government. Houses in multiple occupation at Shelter England. Houses in multiple occupation (HMOs) at Shelter Scotland. Heaton HMOs & Tyneside flats at Newcastle Residential Areas.